Celeborn (S: 'silver-tall', pron. [ˈkeleborn]) was a noble Elf - a member of the Sindar - who wedded Galadriel of the Noldor. After crossing the Blue Mountains at the beginning of the Second Age and living in the realm of Eregion for a while, he and Galadriel moved to Lothlórien to become the Lord and Lady of Lórien. His daughter Celebrían married Elrond Half-elven whose daughter Arwen chose a mortal life to wed Aragorn. In the early Years of the Sun Finrod and Galadriel came to Doriath as guests of Elu Thingol, the King of Doriath. There Celeborn and Galadriel met, fell in love and were wedded. Galadriel remained in Doriath with Celeborn after Finrod went to the Caverns of Narog to establish the stronghold of Nargothrond. After the fall of Beleriand, Celeborn and Galadriel came to Lindon the coastal region west of the Blue Mountains. 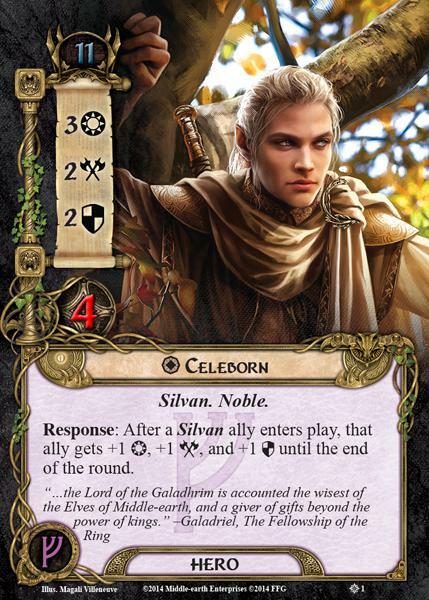 Celeborn ruled the fief of Harlindon, which was composed mostly of Sindar, under the High King Gil-galad. They eventually came to Eregion where they dwelt for a time with Celebrimbor and the jewelsmiths of Gwaith-i-Mírdain. After Celebrimbor had largely taken over, they made contact with the Nandor of Lindórinand, across the Hithaeglir. Not long after they went through Khazad-dûm to live there, becoming great among its people. Celeborn returned to Lothlórien, but the power of Nenya was broken. It no longer was filled with the light and life it had before. Galadriel shortly after passed West with the other Ring-bearers, and Celeborn, weary, moved to Imladris to live with Elladan and Elrohir, Elrond’s sons. After Círdan's departure Celeborn was the last of the Wise in Middle-earth, they that had seen the struggles of Elvenkind. It is not recorded when he sought the Grey Havens and sailed west, but when he did so he took with him the last memory of the Elder Days in Middle-earth. 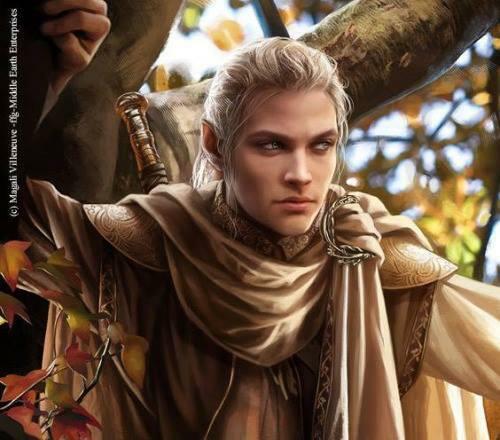 According to an alternate history of Celeborn and Galadriel in Unfinished Tales, Celeborn was a Teler of noble rank in Alqualondë, born Teleporno, grandson of Olwë, King of the Falmari. Artanis, Olwë's granddaughter and a Noldorin princess of great beauty, often spent long visits to Alqualondë and her mother’s kin. During this time the two fell in love, and Teleporno gave her the romantic epithet Alatáriel, meaning 'Maiden Crowned with Radiant Garland'. Teleporno's name gained an additional Quenya form, Telporno (pron. [telˈporno]). In Beleriand, Teleporno and Artanis were greeted by Elu Thingol, High King of the Sindar and Lord of Doriath. Teleporno eventually Sindarinized his name to Celeborn; Artanis Sindarinized the epithet Celeborn had given her, and Alatáriel became Galadriel. In his first writings (which make up the bulk of the matter of Celeborn)and the works published during Tolkien's lifetime, the elf-lord is portrayed as a kinsman of Thingol and one of the Sindar, and met Galadriel when she came with the Noldor into exile. This was the approach chosen by Christopher Tolkien and Guy Gavriel Kay for The Silmarillion. In a brief, speculative paper written by Tolkien included in Unfinished Tales, Celeborn is made Thingol’s grandnephew, by the King’s brother Elmo. Elmo, also linked to Círdan, appears nowhere else in the legendarium. A Sindarin origin as Elmo's grandson has been the most widely accepted one of all, but Celeborn as a Telerin prince seems a late development. It's unknown whether Tolkien would have revised the story or would have felt bound by published writings. In Tolkien's last writings Celeborn is a Falmarin Elf from Valinor, then named Teleporno in Telerin. The name Teleporno was then 'Sindarized' as Celeborn. In this account Celeborn is stated to have been a grandson of the Telerin king Olwë, so that he still was a kinsman of the Sindarin king Thingol. This altered origin was not adopted into the published Silmarillion, primarily because it contradicted canon and was not incorporated in Tolkien's drafts of the earlier parts, and therefore would have necessitated a major rewrite by C. Tolkien and Kay to account for a separate departure of Galadriel. A further problem was that this descent would have made the couple first or second cousin (assuming that he was still to be considered closely related to Thingol), and Elves never married close kin. However, in the Morgoth's Ring it is stated that the first cousins might marry, but seldom did so, or desired to do so. Celeborn is a Sindarin name, consisting of celeb ('silver') + a derivative of ornā ('tall'). Teleporno, his original Telerin name, has an identical meaning. The name Teleporno was 'Sindarized' as Celeborn: Telerin telpe ('silver') (Quenya tyelpe) was transformed to Sindarin celeb. He was given the epithet 'the Wise' by Galadriel in The Lord of the Rings.